New Zealand's busiest tourist season is during the warmer months, from around November to April. The peak travel time in NZ is the summer school holidays, from mid December to late January. Transport and accommodation do fill up during these holidays, as Kiwis themselves are traveling during these months, so it is advised to book ahead or travel outside the holiday months. Autumn is also a great time to visit, as the temperatures are still warm, and there are less people about from Easter onwards. So it may be more pleasant to visit NZ either side of this hectic period. November and April are slightly cooler, but these months are noticeably quieter and are in many ways the best months to travel. October and May are quieter still and cheaper months to travel. Though snow falls may occur at altitude during this time of year, the weather is cool but mild in much of the country. June to September is the season for winter enthusiasts, but away from the busy ski areas, some accommodation, transport services and activities close down. Some of the tramping trails are closed due to snow and ice, as are some of the pass roads. However, NZ is not like some countries where the weather is so miserable in winter that there's no point in going. Come prepared for New Zealand's widely varying and very changeable weather. A t-shirts and shorts day in the Bay of Islands, can also bring snow and sleet on a high pass in the Southern Alps. In fact, on any of New Zealand's mountains you may often expect t-shirt and woolen gear on the same day. If you're tramping, proper gear can save your life. For a tramping checklist, please check here. Bring waterproof gear even if you're not tramping. When it rains in New Zealand, it pours! Generally working with layers is a good way to dress for different types of weather. Almost everyone needs a passport to enter New Zealand. If you enter on an Australian or NZ passport, or on a passport containing an Australian or NZ residence visa, your passport must be valid on arrival. All other must have passports valid for at least three months beyond the time you intend to stay in NZ. Australian citizens or holders of current Australian resident class return visas do not need a visa or permit to enter NZ and can stay indefinitely, if they do not have any criminal convictions. Australians do not require a work permit. Cirtizens that belong to a country in the visa waiver program do not need a visa either, and are given a three month extendable visitor permit upon arrival, provided you can show an onward ticket and sufficient funds to support your stay. Business hours are generally 8.30am - 5pm Monday to Friday. Retail stores are open from 9.00am-5.30pm Monday to Friday, while the larger supermarkets are open late from 7 or 8am until as late as 10pm, 7 days a week. Petrol stations in the larger cities are open 24 hours. New Zealand has its own dollar as currency. There are $5, $10, $20, $50 and $100 notes and 5c, 10c, 20c, 50c, $1 and $2 coins. Banks are open from 9.00am-4.30pm Monday to Friday, and in some larger cities you may find banks which are open Saturday mornings as well. ATMs at most banks offer access to overseas accounts via networks such a Cirrus, Maestro and Plus. You can also get cash advances over the counter at banks or via 24-hour ATMs that display Visa or Mastercard symbols. All major credit cards (Visa, Mastercard, American Express) are accepted in New Zealand. Travellers cheques are always a safe way to carry money and their exchange rate is slightly better than for cash. Generally all accommodation providers have internet access available. There are also many internet cafes everywhere and public internet access is generally available in libraries. You should also be able to connect to the internet using your mobile in most areas, but once you go into more remote areas, you won't have coverage. For all emergencies (police, fire or ambulance), the number to dial is 111. Electricity is 230/240V AC, 50Hz, as in Europe and Australia. Australian-type three-blade plugs are used. Many hotels also provide 110V AC sockets. Converters will be needed for appliances designed for DC supply. Tap water is clean and safe to drink in NZ. Water in lakes, rivers and streams is often OK, but giardia has been found in these sources. Water from these sources should be purified before drinking. The most annoying insect you'll probably encounter is the sandfly. 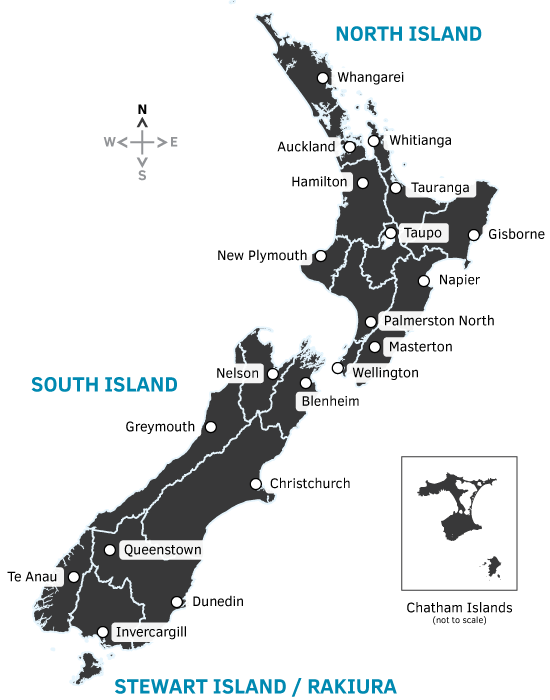 When sandflies attack, they attack in swarms, especially on the West Coast of the South Islands and in the Fiords. Plenty of insect repellent is a necessity when sandflies are around. If you do get bitten though, the trick is not to scratch when it starts itching. If you don't scratch, the itch will dissapear fairly quickly, but if you do, you will be scratching for days! Mosquitoes appear after dusk, but they appear to be less present than that pesky sandfly. Apart from that, New Zealand has no dangerous wildlife. You can get sunburnt in New Zealand very quickly, even through cloud. The UV index is extremely high in the summer. Use a sunscreen with high SPF, a hat and a barrier cream for your nose and lips. It is also advisable to wear sunglasses. New Zealand is a great country to travel with children. Health problems are not an issue, getting around is easy and many attractions and activities cater for children. Family passes are usually available and theme parks and attractions.